Doom Town Productions presents Sweet F.A. Posted on February 5, 2010 No Comments on Doom Town Productions presents Sweet F.A. 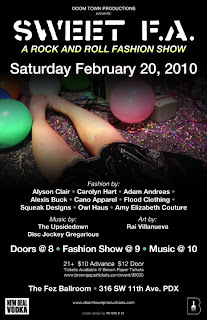 Come see a sweet rock n roll fashion show with some of Portland’s most creative designers. It’s the sixth time I’ve done it and have to say it’s always the most fun and entertaining show I do.